A-50 planes are used to detect and track air targets and surface vessels, warn automated systems of command posts and to control airplanes in sighting. 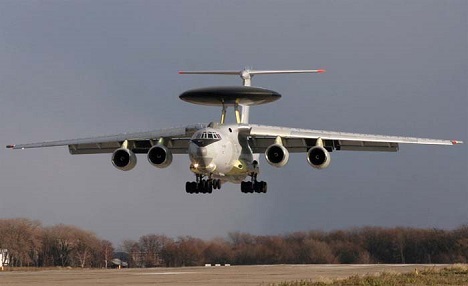 India plans to buy three airborne early warning and control (AEW&C) A-50 aircrafts from Russia, a source in Russian governmental military and industrial commission told Itar-Tass, from the sidelines of the Oboronexpo-2014. India had ordered three such warplanes in 2003. “India is mulling possible delivery of another three AEW&C aircrafts, talks are on now,” the commission’s source said. He did not specify a timeline planned for a deal to be finalised. The delivery of AEW&C aircrafts is planned “in the same configuration” as under the agreement in 2003, he said. A-50 built on the base of a military transport airplane Ilyushin Il-76MD was brought into service in 1989. A-50 aircrafts are used to detect and track air targets and surface vessels, warn automated systems of command posts and to control airplanes in sighting. “We're overhauling the second Indian aircraft, and the next plane is to arrive in about four months,” Yudin said, adding that the overhaul would include a minor upgrade. He added that India was no longer interested in these planes and was unlikely to buy new ones. India purchased five Il-38s in 1975 – 1983. In the 2000s they were upgraded to the Sea Dragon version, featuring 14 hours of loiter time at a speed of 400 km/h. The maximum speed of these planes is 610 km/h, and the maximum range is 6,500 kilometers. In 2009, India signed a $2.1-billion contract to purchase eight US-made P-8I Poseidon anti-submarine aircraft. The first plane was supplied in 2013. India has an option to buy four more planes for $1 billion. Indo-Russian joint venture BrahMos Aerospace is also participating in Oboronexpo-2014. The entire BrahMos missile family, which can be launched from the air, land, sea surface, or underwater, is being showcased at the exhibition that is being held near the Russian capital on August 13-17.